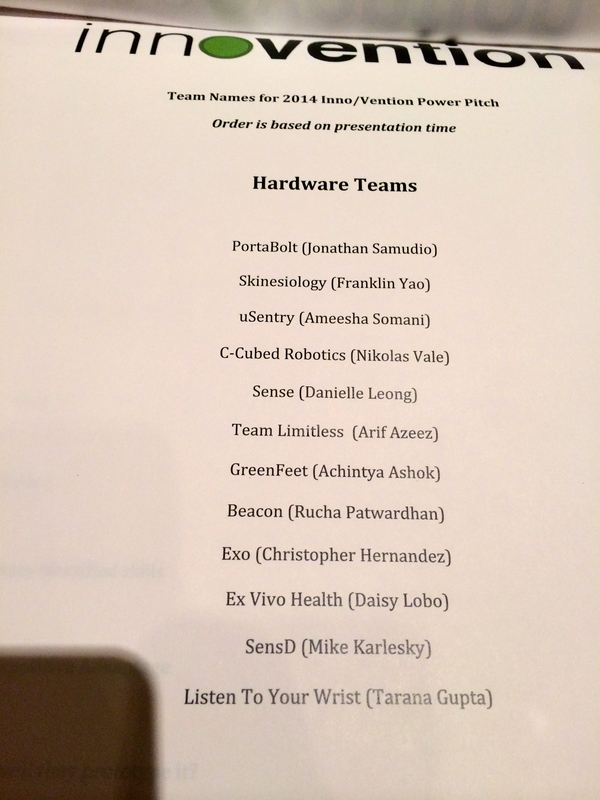 Last night I was invited to judge the NYU Polytechnic School of Engineering Inno/Vention Power Pitch hardware (There was a software competition. I did not judge that) competition. This competition is a student run event sponsored by the EIA student club. I love going to these events to see and hear the product ideas the students have and how they plan on executing the business. This is how it works: At the start of the semester the EIA holds an event called the Sparkstart Kickoff/TeamHunt. At this event the students announce their ideas and hunt for people they would need to build their team. During the next several weeks the students attend educational events to help them develop their idea further into a business. They learn customer validation, market research, product development, business model canvas and various techniques from the great mind of Steve Blank. The students gave their first pitch at the event last night. Five teams are picked to move forward to the next pitch event. The student teams are given a stipend to spend on prototyping. There is a schedule for the Inno/Vention Competition here.